The hillside in Parc de la Jacques-Cartier in Quebec, Canada which runs along the river, displays its Autumn reflections as the sun nears its bedtime. The Jacques-Cartier River is like a sheet a glass and the reflections barely shimmer in the water unless something or someone creates a ripple across the surface. Riviere Jacques-Cartier, Jacques-Cartier River, during fall in Parc de la Jacques-Cartier, Quebec, Canada. 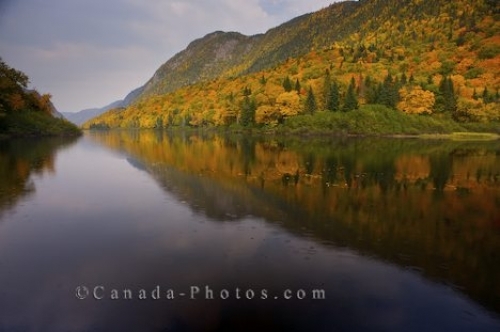 Picture of the Autumn colored hillside and their reflections in the Jacques-Cartier River in Quebec, Canada.